The wait is over. To her growing pedigree of aspiring folk singer-songwriter, architect of many sublime live performances and a curator of an inaugural EP, Kitty Macfarlane is now the proud possessor of a stunning debut album. NAMER OF CLOUDS hit the shelves on September 21st and these will soon empty when word gets around of what a compulsive record she has made. The eleven tracks are a subtle mix of solo compositions, co-writes and old song arrangements, blending many facets of what keeps the folk tradition fresh and vibrant without choking off the heritage. Since first seeing Kitty play live a couple of years ago when opening for Kathryn Roberts and Sean Lakeman, a keen ear has lent towards her career. This further compounded when she played a headline gig at the Kitchen Garden in Birmingham earlier this year, a show where many of the songs from the new album had their introduction. Joining Kitty on the album in one of the co-producing roles is Sam Kelly, a musician from the same generation who is increasingly popping up in collaboration on a scene gathering momentum in acoustic circles across the land. No doubt leading much of the stringed accompaniment that engineers the soundtrack has been the forte of Kelly and co-producer Jacob Stoney, but make no mistake the stamp of Kitty’s gorgeous vocal acumen and imaginative approach to song curation reigns supreme. The natural world and the immediate surroundings of rural Somerset play a strong role in forming the subject content of the album. While not being unique to the West Country, the title track is quite literal in its meaning as it provides focus on Luke Howard, a man responsible for coming up with familiar name structure that is commonly attached to clouds and their formation. Where else but folk music would such a subject be addressed in song. ‘Namer of Clouds’ is one of the album’s co-writes, a formula that also proves a winner when it comes to possibly the standout track. ‘Sea Silk’ is the mesmeric story that unfolds after Kitty and Sam embarked on a trail of an ancient craft still practised in Sardinia. Meeting up with the last person on earth to carry out a slice of textile weaving with a mythical past proved fruitful. It even heralded the perfect field recording to introduce a song that sparkles in the shade of the golden subject. The strong melody found in the chorus provides the hook that carries the track further than just immersing oneself into the curious story. ‘Man, Friendship’ sees Kitty draw inspiration closer to home as the flooding of the Somerset levels in 2014 presented an opportunity to take an abstract view on it from the comfort blanket of a reassuring song. Like much of the record, there are many crevices to explore and you never feel that an extra spin is wasted. Two tracks distinctly remembered from her Birmingham gig earlier this year were ‘Starling Song’ and ‘Glass Eel’. The former opens the album in a whirl of two-minute splendour, while the latter is forever memorable as it pairs migration in the natural world with the human kind that has always been pertinent in a fluid civilisation. These are two examples of Kitty in solo writing mode, a skill in which obviously she excels. In fact, whatever the source of, or inspiration for the songs, the execution creates a mystique and a desire to delve deeper. 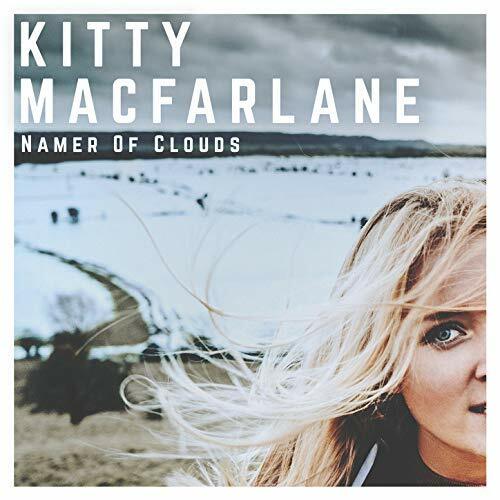 NAMER OF CLOUDS will grab the attention of media influential in moving the career of Kitty Macfarlane forward, but more importantly from a grounded perspective, it will resonate strongly in the ears, heads and hearts of those active in pumping the heartbeat of the live music scene. These folks put their money down and respect music in its most connective form. The music of Kitty Macfarlane both soothes the mind and sparks an element of curiosity. The album will confirm what folks in the know already believe, and more widely, engage splendidly with any new converts taking a peep.